Selling a house can be a difficult task or an easy one depending on how you have maintained it and the staging at the point of selling. While all rooms in the house are essential, kitchens are particularly very crucial. People spend hours in it. Families get to take their breakfast together in the kitchen, and you can even entertain your workmates and other guests in your kitchen. For this reason, the kitchen is given a lot of considerations by home buyers. This article addresses some important factors in the kitchen that will make it easy for you to sell your San Antonio house. If your kitchen is extremely small and you want to attract serious cash buyers in San Antonio Texas who will buy your home in cash or within the specified time limit, make your kitchen spacious by bringing down some walls. This applies if the kitchen is tiny and there is no any other way of making it more spacious. Demolish that wall that separates yours dining room from the kitchen. While at it, make sure you consult a professional so that you don’t mess with the house’s stability. Painting your walls and ceiling with white paint will give the illusion that your kitchen is bigger than it is. When it comes to kitchen tiling, ensure that the tile colors are uniform, mixing colors will only make the room seem smaller. Don’t put all your favorite kitchen wares on top of the counters. Remove them, leave a coffee maker, or a toaster and a basket of fruit to add life to the kitchen. The area near the stove should have enough room for potential buyers to view and inspect it if need be. If you are selling your old house after buying a new home, it would be advisable to move to your new home so that you can move the big appliances such as the refrigerator. The kitchen is commonly used to display kids’ drawings and other intimate things that you probably don’t want to get rid of. A move will ensure that all your valuables are safe and still leave some room in the old kitchen. You can bring down the cabinets if they are taking up lots of space and use floating shelves. If you decide to stick with the cabinets, then put them all the way up to give more room for storage and create more vivid vertical lines that make the kitchen seem bigger. If your house has the old model windows, bring them down. Create room for larger windows. A spacious and well-lit place has a way of getting people’s attention. Clean the windows thoroughly form the inside and outside. If there are curtains or blinds, remove them every time a potential buyer comes to view the house. 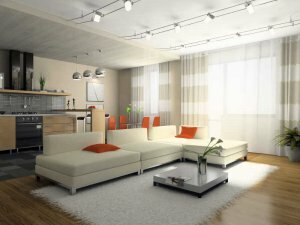 Modern home buyers are looking for spacious floor plans combined with proper lighting. If possible, natural light. A large kitchen window will give a beautiful view of your neighborhood or backyard. If the vast windows bring in too much light, use some beautiful silhouette blinds. If having a bigger window is not an option for you, then utilize the modern electrical lighting options using latest fixtures. Have task-specific lights to light up the stove area, in the cabinets, and on the counter tops. Such lighting adds aesthetic value to your home as it brings out the architectural beauty or layout of the counters. Don’t forget the general ceiling light that illuminates the rest of your kitchen. Accent lighting can also be used to highlight a particular area in your kitchen. If your kitchen cabinets and counter tops are dark, then paint the kitchen walls brightly. The color should be neutral but bright, not necessarily white but something simple and lively. Light up all the bulbs when you bring in potential house buyers in San Antonio. If your cabinets are worn out, call a carpenter to repair them. If you are still living in the same house at the time of selling, make sure that the cabinets and drawers are not too congested. Your buyers will have the impression that there is not enough room in your kitchen. If your kitchen is spacious enough, you can install more drawers and even a pull-out pantry. If your kitchen has small space, then use floating shelves and open shelves but make sure they look appealing. The open shelves are not everybody’s favorite but the way you set it can help sell your house. Ensure that the dishes you put there are not clustered. Leave space in between the utensils and let them be of uniform color. A set of white dishes paired with clear glasses are a perfect combo. To make your kitchen more appealing, keep a collection of cookbooks on one shelf. If you have old counter tops made of wood, replace them with granite. 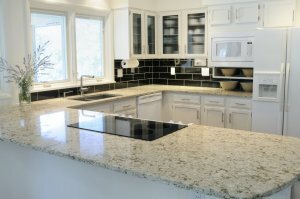 Every home buyer is looking for a granite counter top. If granite is too expensive for you, then go for any other modern material that has a granite-like pattern. Ensure that the counters are clean and de-cluttered. Leave a basket of fruits or fresh flowers in a vase on top of the counters. The sinks and faucets should also be leak free. If the taps are old, they will nullify your efforts of having an attractive counter top, replace them with modern but affordable faucets. Clearly, a kitchen needs to be fresh and very clean at all time. A well-lit and spacious kitchen will be welcoming and comfortable to be in. Don’t overdo the kitchen appliances or the utensils, only have the things you use daily. De-congest the kitchen. Remember to leave some fruits or a flower vase to make the kitchen feel and look homely. Call us at (210) 547-7505 now!